When I have the opportunity to speak about starting a company, I take time to look back at where I’ve been, think about what I’ve learned along the way and try to pass on some of my best pearls of wisdom. I spoke during Career Day at Anna’s school recently on what it’s like to start a business and while I’m not clear on whether I inspired any of the students to become entrepreneurs, I did accomplish one of my goals of not embarrassing Anna and permanently injuring her social status with any of my stories. When I look back at our journey starting Anna’s Gourmet Goodies, I am struck by the number of people that have stopped to help me along the way. One of my managers early in my sales career, Don Brown, used to say that the nine most powerful words in the English language are, “I have a problem, and I need your help”. It might seem like an overstatement, but the number of people that have said ‘Yes, I can help’, far out number those who’ve turned away. A few months ago, the Kroger store in Wakefield Commons shopping center closed their doors. Some employees transferred to other company stores, while others found work at new businesses. Faye, one of the ladies in the bakery, went to work for a dry cleaner. 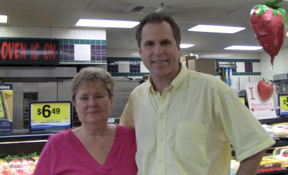 She was one of the first people I remember helping me when we started Anna’s Gourmet Goodies nearly ten years ago. I wondered into the bakery one day and had some questions about packaging and where they purchased various items. Faye always had time to help and even sold us some supplies to get us started. I visited the store many times over the years and she always had a smile and a word of encouragement. We started our business using flour from Lindley Mills. 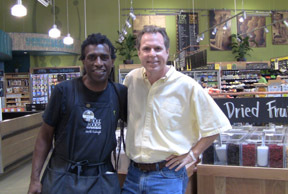 We found it in Whole Foods market where Mike Davis worked in the bulk food section. I knew a little about flour, but Mike was always very helpful whenever I had a question about anything in his area. We started buying in small quantities, but as our business grew, he helped us increase our capacity and reduce cost by ordering in bulk when we were too small to buy direct, but needed more than just a few pounds. Website. I designed our website to be a friendly place with helpful information. When a customer comes to AnnasGourmetGoodies.com, we want them to be able to find the products and information they need – not just what we are trying to sell that day. A great website should be helpful to visitors. Orders. Before we ship an order, we import the address information and check it for validity. If it does not show up as a valid address, we’ll first try to find the correct one if it is a small typo, then we’ll contact the customer for clarification And if we find a typo in the message, we’ll fix that as well. We help our customers by getting the gift to the right address with the right message. History. When a customer sets up a custom label or note card, we save that for later use. If a customer sends us a list, we save that as well in case there are questions in the future, or that want to use it again. We help by remembering the order details for our customers. At Anna’s Gourmet Goodies, we’ve adjusted our business with new products and ideas over the years, but a core principle of our company has not changed – we genuinely try to help people, whether or not they are a customer. We seek out and nurture those suppliers, business partners, and people that offer up their help and advice. By doing so, our goal is to build a community of loyal customers and suppliers who value what we do and share that experience with others who have similar beliefs. We absolutely make outstanding gourmet cookies, but our passion for service and being helpful by offering our knowledge and expertise are key ingredients in all of our recipes.